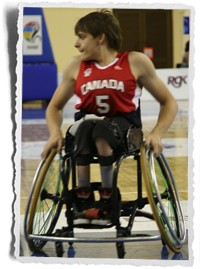 (Adana, Turkey) The Canadian Men’s U23 National Team wrapped up the preliminary round of competition at the 2013 Junior World Wheelchair Basketball Championship today with an 83-48 loss to Iran. Canada concludes the round-robin portion of the tournament in fourth place in their pool with two wins and three losses. They will now advance to the quarter-finals on Thursday where they will face Sweden. Iran quickly established the pace by scoring the first basket just 12 seconds into the game, and never looked back. With 4:37 remaining in the first quarter Nik Goncin, of Regina, Sask., made a layup to keep Canada within two points, briefly making the score 8-10. Iran responded by scoring the next 10 points before Liam Hickey, of Saint John’s N.L., hit both of his free-throws to end the run. Vincent Dallaire, of Quebec City, Que., followed up by draining a basket in the dying seconds, but at the end of the first quarter Iran held a comfortable 20-12 lead that they would not relinquish. “We are a young team that learned some lessons today playing a tough game against a very experienced opponent. Iran showed us that we need to elevate our game and be prepared to play differently in the playoffs,” said Team Canada Head Coach Steve Bialowas. Iran kept their foot on the pedal in the second quarter scoring 16 of the first 20 baskets and by halftime they had extended their lead to 42-20. Canada remained spirited and continued to push back in the third quarter. Kevin Wakeling, of Cambridge, Ont., and Mitch Bossaer, of Saskatoon, Sask. provided a spark when they came off the bench to have an immediate impact. Wakeling put up a shot that narrowly missed and the rebound was collected and potted by Goncin. Moments later Bossaer hit a free throw and Dallaire capped off a five point Canadian run with a layup. Dallaire ended the game with a team-high 12 points, two rebounds, and an assist. Goncin also reached double-digits scoring 10 points, and pacing his team with 8 rebounds and 5 assists as part of a Canadian contingent that saw eight different players appear on the scoresheet. Hickey pitched in with eight points and four assists, while Philippe Vermette, of Sherbrooke, Que. and Bossaer scored six and five points respectively. Team Canada (2-3) will play against Sweden (4-1) in the quarter-finals on September 12 at 12 p.m. ET.